The de-finition/method is a text written by the artist that precedes the painting. It expresses a goal to be achieved. It is not just the simple statement of an idea, but rather a collection of instructions, of provisions formulated for the charge-taker. The charge-taker is the collector who acquires – or the curator who exhibits – and accepts the responsibility of implementing a de-finition/method. He is essential to the existence of the painting, for without him, the work remains in an unrealized state of possibility. “the artist does not impose this or that color on the chargetaker who must then live with it.” In each text, the artist allows the charge-taker a certain number of choices. It is precisely this incomplete character of the definitions/methods that gives the work a dimension of evolution. The owners or exhibitors become actors in its creation, the work mutating along the course of their propositions. Claude Rutault delegates to the charge-taker a set of decisions that usually belong to the artist: the color of the canvases as well as the format, the form as well as the hanging of the canvases. The actualization of a de-finition/method by the charge-taker is the current, visible state of the work in a given place and time. It is of limited duration, until the next actualization in a different place, on a wall of a different color, in another format, etc. The manner of presentation of the painting is endlessly modifiable. Thus, what a viewer discovers when visiting an exhibition of Claude Rutault is only one of the different forms a de-finition/ method can take. In 44 years, Claude Rutault has developed a body of 654 works. The artist goes beyond the strict relationship between the canvas and the wall, and multiplies the possible scenarios in his texts by imagining a multitude of presentation modes: paintings forming a puzzle (“generalized painting-puzzle”), piles of canvases leaning against a wall, canvases placed on the floor, hung from the ceiling (“dream canvases”), canvases turned towards the wall (“toward a self-portrait of painting”), going so far as the utilization of raw canvases, left unpainted. The scenarios become increasingly complex and may be executed by several charge-takers, playing with the passage of time, the geographical location of the actualization (“AMZ” or “im/ mobilier”) or the collections of a charge-taker. The temporal dimension of Claude Rutault’s paintings is determinative; his work plays with time rather than enduring it, it is the driver. This is one of the fundamental givens of this work of painting that so radically distinguishes itself from other current productions. It is no longer the point of view that changes, but the work itself, along the course of its actualizations and the passage of time. 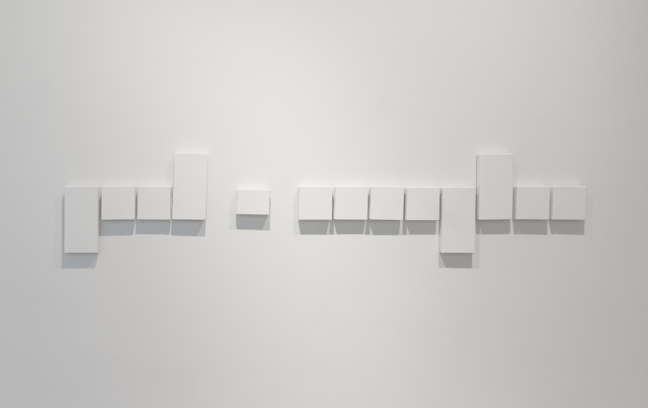 Claude Rutault, de-finition/method “toward a self-portrait of painting”, 1993.
de-finition/method: … 4, 5, or 6 canvases of various shapes, large and medium-sized, painted the same color as the wall in front of which the work is standing. 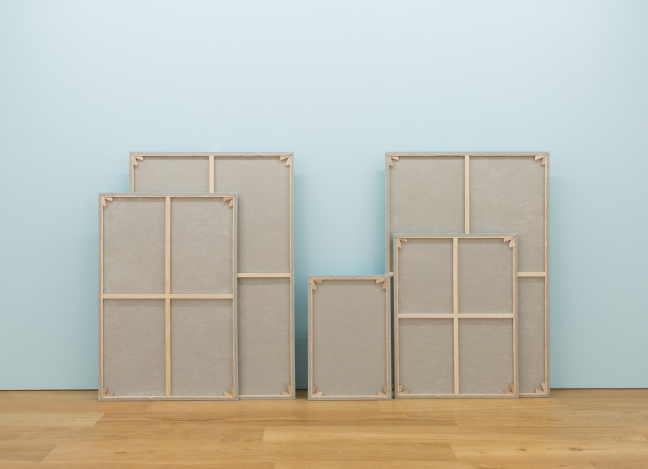 the canvases are set up on the floor, supported by structures made of the same wood as the stretchers and placed behind the canvases like easels, keeping them parallel to one another and as vertical as possible. 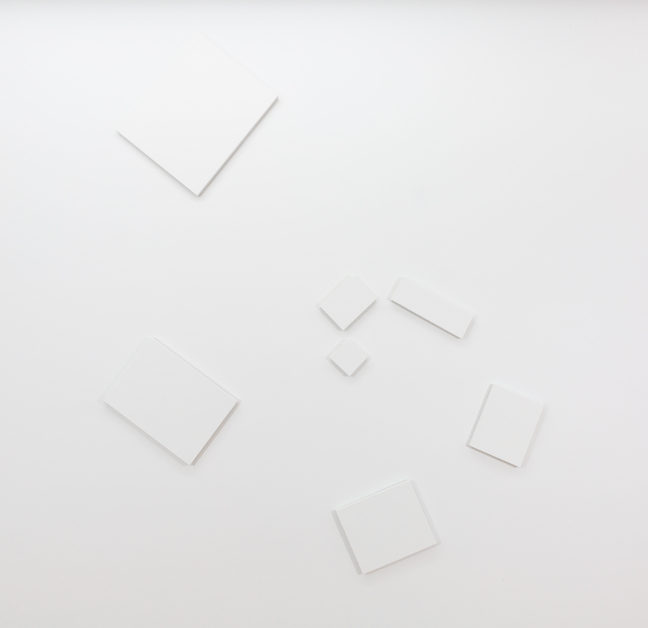 the canvases are arranged in front of a wall. the first is placed so that it is impossible to walk between the wall and the canvas. the others are slightly offset from each other, so that they create a dense yet airy mass of overlapping planes. their arrangement creates an empty space in the center of the composition, a vertical or horizontal rectangle open at the top, suggesting the self-portrait of a missing person, poussin or… the lighting must not create overly-defined shadows. de-finition/method: this painting is made of 13 small rectangular or square canvases arranged to write the word “post-scriptum”, which must be decipherable like a picture, e.g. watteau’s “gersaint’s shopsign” or mondrian’s “pier and ocean IV”. list of canvases: 8 canvases 15 x 15 cm (6 x 6 inches), 4 canvases 30 x 15 cm (113/4 x 6 inches), 1 canvas 7,5 x 15 cm (3 x 6 inches). all canvases are painted the same color as the wall on which they’re hung. the word takes the painting to the letter and vice-versa. it cannot exist on its own. it creates a visual link between two other hanging paintings. it both brings them together and keeps them apart. “post-scriptum” can make this link between two of claude rutault’s works, between one of claude rutault’s and one of another artist’s, or between two works by artists other than claude rutault that are present in the collection. even simpler, “postscriptum” can announce the new actualization of a de-finition/method that the charge-taker already owns. de-finition/method: a photograph is hung on a wall. if the photograph is black and white, the wall is a color; if the photo is in color, the wall is white. 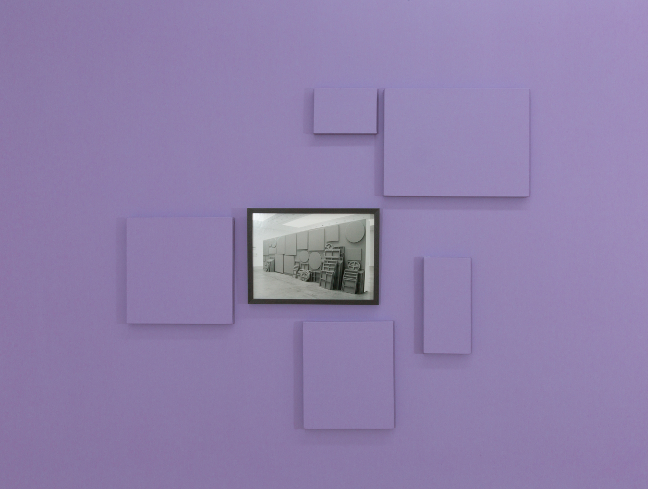 the photo is surrounded by at least five canvases of standard formats and painted the same color as the wall. the dimensions of the canvases can vary, but should be close to that of the photo. both the number of canvases and their arrangement are left entirely up to the charge-taker. from one actualization to the other, everything can change – the canvases, the color, the arrangement, and even the photograph. this de-finition/method can also be actualized with two or three photographs – three at most – hung very close to each other to form a unit. the number of canvases will then have to be increased so that the idea remains clear. de-finition/method: a series of irregular shapes that never quite fit together; parts of the wall can be seen between them. yet they touch at many points. 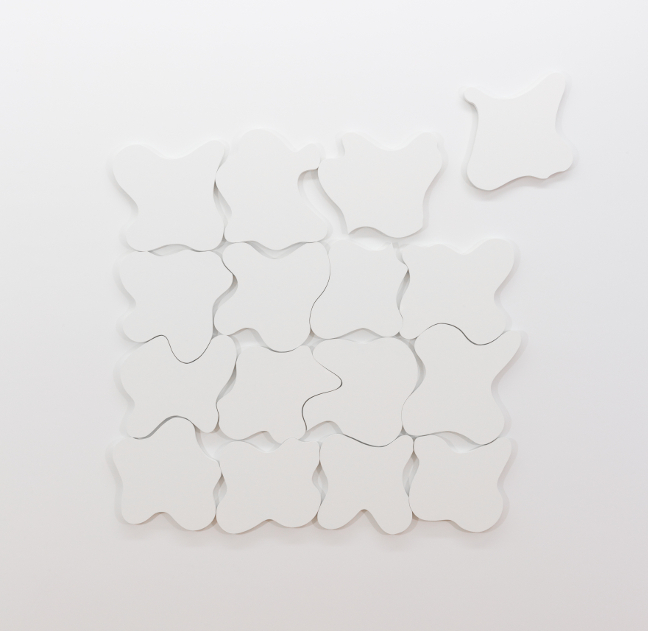 they form a quasi-puzzle in which each shape has a well-defined place. the charge-taker is free to hang them any way he or she wants, and may actualize a single puzzle or arrange its parts into several groups to be shown together in the same space. one part may even be isolated. these shapes are painted the same color as the wall on which they’re hung. de-finition/method: a series of small canvases—though other supports can also be used from time to time—are hung in an off-center spiral. it uncoils and may reach the edge of the wall. all of its elements are painted the same color as the wall. although the number of supports is not pre-determined, the spiral that they create should be readable at a glance. the creation and installation of the spiral are the charge-taker’s responsibility, and he or she can change the work at will within the rules given above.